Several weapons used by militants during the Paris attacks were made in Serbia in the late 1980s, the head of a Serbian arms factory has said. Milojko Brzakovic, director of the Zastava Arms factory, said they checked the serial numbers of around eight rifles received from police. The M70 assault rifles were part of a batch sent to military depots in Slovenia, Bosnia and Macedonia, Mr Brzakovic told the Reuters news agency. The Paris attacks claimed 130 lives. Gunmen opened fire or set off bombs at seven locations during the attacks on 13 November. "There's no doubt they were produced by us, we were the only producer then, and we have serial numbers of everything we ever produced, but in the 1990s anyone could get a hold of them in army depots," Mr Brzakovic told Reuters. The M70 rifle is a modified Yugoslav version of the Soviet AK47. Zastava Arms, based in the town of Kragujevac and previously known as Zavodi Crvena Zastava, served as the only state arsenal for small arms for the now-defunct communist-era Yugoslav army and police. After the Balkan wars of the 1990s, many military weapons stayed in the hands of citizens. Many of these weapons have found their way to Western Europe by being smuggled in small quantities, says Nils Duquet of the Flemish Peace Institute. 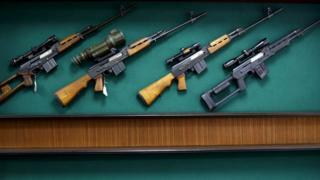 There have also been reports of weapons from the former Yugoslavia being used by Syrian rebels in the Syrian civil war.